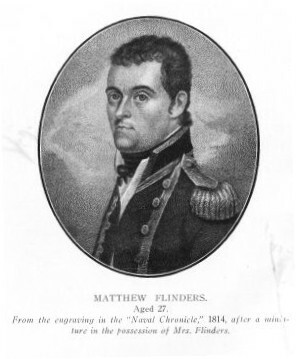 Matthew Flinders (16 March 1774 - 19 July 1814) was one of the most accomplished navigators and chartmakers of his age. In a career that spanned just over twenty years, he sailed with Captain William Bligh, circumnavigated and named Australia, survived shipwreck and disaster only to be imprisoned as a spy, identified and corrected the effect of iron ships upon compass readings, and wrote the seminal work on Australian exploration A Voyage To Terra Australis. Born in Donington, Lincolnshire, England, the young Matthew Flinders had his hunger for exploration and knowledge whetted by the tale of Robinson Crusoe, and at the age of fifteen he joined the navy. Later, he sailed with Captain Bligh on The Providence, transporting breadfruit from Tahiti to Jamaica. Later, Flinders sailed to Australia on The Reliance, establishing himself as a fine navigator and cartographer, and in 1796 explored the coastline around Sydney in a tiny open boat called Tom Thumb. In 1798 he circumnavigated Van Diemen's Land (later renamed Tasmania) aboard the sloop Norfolk, therefore proving it to be an island. The passage between the Australian mainland and Tasmania became known as Bass Strait after the ship's doctor, George Bass, and a large island was named Flinders Island. On 17 April 1801 Flinders married Ann Chappell, but was soon forced to leave his new wife when the British Government sent him back to Australia. He set out that July, in command of The Investigator, to produce a detailed survey of the coastline of Australia, the southern coast of which was still unknown. Flinders was the first European explorer to visit the You Yangs ranges near Geelong. On May 1, 1802, he and three of his men climbed to the highest point and named it "Station Peak". This title was later changed to Flinders Peak in his honour. Between December 1801 and June 1803, Flinders charted the entire coastline of Australia. He sighted Cape Leeuwin on 6 December and worked his way eastwards until he reached Fowlers Bay on the 28 January. From that point on, the coastline was uncharted.